They manage their emotions, thoughts, and behaviors in ways that set them up for success in life. 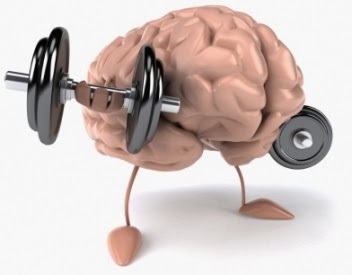 We can take yoga classes or work out or run, but when it comes down to it, mental strength is our biggest limiting factor. We're very self aware of our weaknesses, but instead of dealing with it head on, we just try to change things externally, on the surface level. If we can't commit to something, we go from thing to thing hoping maybe this time we can engage, instead of trying to make our mindset better at being committed. To be healthy and successful, you need key characteristics - tenacity, grit, optimism, resilience, and an unfailing ability to deal with failure and convert it to the positive. There are many articles about what successful people do, what about the things they avoid? Amy Morin, a psychotherapist and licensed clinical social worker compiled a list I'd like to share along with my thoughts. 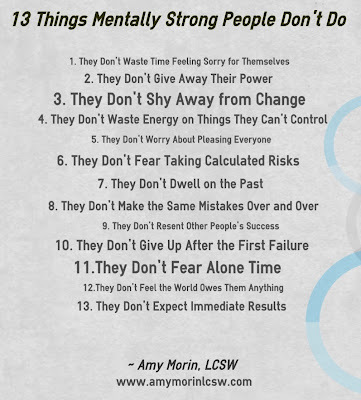 Mentally strong people don’t sit around feeling sorry about their circumstances or how others have treated them. Instead, they take responsibility for their role in life and understand that life isn't always easy or fair. They emerge from trying circumstances with self awareness and lessons learned to move forward. They don’t allow others to control them, and they don’t give others the power to make them feel small or bad. They understand they're in control over their actions and emotions. Their strength comes from their ability to manage the way they respond. 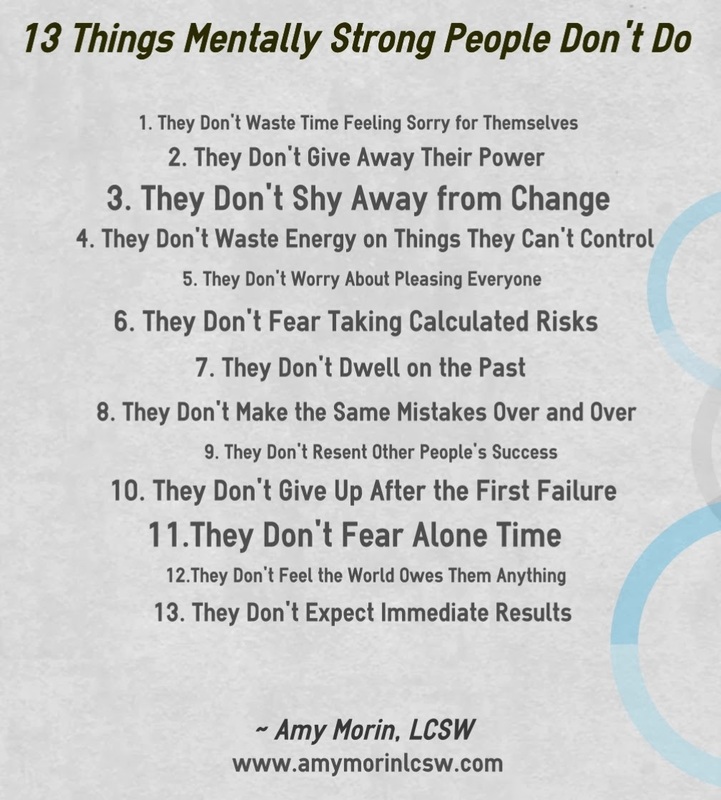 Mentally strong people embrace change and welcome challenge. Complacency and stagnation, not the unknown is their biggest fear. They are flexible and understand that change is inevitable and believe in their abilities to adapt. You won’t hear a mentally strong person complaining over lost luggage or traffic jams. Instead, they focus on what they can control in their lives. They recognize that sometimes, the only thing they can control is their own response and attitude. Mentally strong people recognize that they don’t need to please everyone all the time. They’re not afraid to say no or speak up when necessary. They also don't go out of their way to dis-please others out of spite or to create an image of independence and strength and rebellion (act out). They strive to be kind and fair, but can handle other people being upset if they didn't make them happy. They will navigate the situation with grace. They don’t take reckless or foolish risks, but don’t mind taking calculated risks. Mentally strong people spend time weighing the risks and benefits before making a big decision, and they’re fully informed of the potential downsides before they take action. Most of all they don't attempt to avoid risk because they understand that is impossible. They develop risk management skills not risk avoidance skills. They aren't controlled by impulse or emotion, but rather intellect. Mentally strong people don’t waste time dwelling on the past and wishing things could be different. They acknowledge their past and can say what they've learned from it. However, they don’t constantly relive bad experiences or fantasize about the glory days. Instead, they live for the present and plan for the future. They think in present tense. They accept responsibility for their behavior and learn from their past mistakes. As a result, they don’t keep repeating those mistakes over and over while hoping for a different better outcome - that would be insanity. Instead, they move on and make better decisions in the future. They self reflect to create accurate and better responses. They ask themselves, "how has that been working out?" If it hasn't been working out well, they change it, they don't keep doing the same thing over again. A "frenemy" is a friend who is also an enemy. They are close with you until you gain success, then they feel betrayed and resentful. Mentally strong people can appreciate and celebrate other people’s success in life. They don’t grow jealous or feel cheated when others surpass them. Instead, they recognize that success comes with hard work, and they are willing to work hard for their own chance at success. Mentally strong people eliminate the frenemies from their lives and avoid being one. Every failure is a chance to improve. Mentally strong people don’t view failure as a reason to give up. Every failure is a chance to learn things they didn't know already. In a scientific experiment, failure is a part of the process, to test theories, and to collect data. If an experiment worked on the first try without failure, there isn't much to learn. Scientists rely on lots and lots of failure, as a process of elimination. Gamers also rely on the same process to problem solve, as do machines (artificial intelligence and machine learning), as do children. Giving up after failure is illogical and goes against the mechanisms of growth. Your ability to grow, succeed, be happy is directly related to your ability to deal with failure. This is called resilience. Depression is the inability to deal with changes, situations, and failures. Mentally strong people can tolerate being alone and they don’t fear silence. They aren't afraid to be alone with their thoughts and they can use downtime to be productive. They enjoy their own company and aren't dependent on others for companionship and entertainment all the time but instead can be happy alone. They don't need a partner to start a business, a buddy to work out with, a friend to eat with. If those things become available, they appreciate it as a perk not a necessity. Independence, not co-dependence. They don’t feel entitled to things in life. They weren't born with a mentality that others would take care of them or that the world must give them something. Instead, they look for opportunities based on their own merits, at every stage. They never feel like they paid their dues, and now their work is done. They don't get a sales job and ask their employer how big of a sales bonus they can hit in six months or ask their trainer how much weight they can lose in two weeks. They understand that it is all earned by their own effort and effectiveness. Whether they are working on improving their health or getting a new business off the ground, mentally strong people don’t expect immediate results. Instead, they apply their skills and time to the best of their ability and understand that real change takes time. They are in it for the long haul and have something many lack, "staying power."